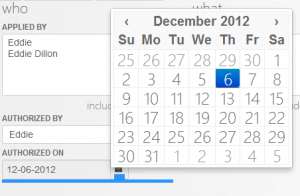 Twitter Bootstrap Datepicker control with custom placement!! This guy took the project to github here: Original Github repo and I recently forked that and you can get the update I have made here: My Github repo. A word of warning with my project, I have removed the little caret arrow that the original project had because I didn’t want to take the time to figure out the triangle by border trick, be my guest if you would like to take that one on, I don’t think its that bad, just needs to be placed at the bottom instead of the top if you are placing the datepicker above the control. The issue I sort-of resolved, well, hacked for my situation can be found here: https://github.com/eternicode/bootstrap-datepicker/issues/200. Here is the final result of what my script will do. Twitter Modal on the phone? No problem!! I have been using Bootstrap sometime now, we love it so much at our company that we have decided to use for our web app. Recently I used it to format the tables in our app and due the responsive nature of bootstrap it just naturally works, here is a link to their base component so you can see it in action: http://twitter.github.com/bootstrap/base-css.html#tables. You can hide and show the columns by simply tagging you elements or divs with a class of ‘hidden-phone’ or ‘visible-phone’ respectively. That was a big win for us due to the responsive nature of bootstrap, now for my main issue. I have been working with Twitter Bootstrap with a project at work and I recently ran into a bit of a problem and I was beating my head into a wall about it and I wanted to share my findings. If you are ever dealing with an open-source library like Bootstrap, make sure you are working with the latest examples and the latest build of the tool. I was following an example I found online and down in the <a> tag they had this: parent=’#accordion2′ and that was fine for the older version of Bootstrap but the new version needs this: data-parent=’#accordion2′. I beat my head against the wall for about an hour trying to figure that one out before I realized I was dealing with an older example. I hope this helps someone, thanks. The app I have been working on has a stackable list view that I have been very pleased with but I notice that you had to click on any item twice to get it work correctly. I was following a tutorial from the guys on the Bootstrap team and they said that you needed to include the collapse plugin to get the functionality I was looking for. After further research I realized that the main bootstrap file that I am using (2.0.0) has the collapse already included in it along with everything else. All I had to do to make it work correctly was to remove the extra library and everything works fine, I hope this helps anybody that is struggling with this issue. And it renders just like I wanted it to, I would have never thought it would be that simple, but it is. I am really starting to like this library, I will keep you updated at time goes on. You are currently browsing the archives for the Twitter Bootstrap category.